Maggie Murphy was born in 1924 in Tempo, Co Fermanagh, Northern Ireland and lived in and around that area all her life. In 1952 Peter Kennedy was taken to see Maggie (then) Chambers by Irish folk-song collector Sean O'Boyle in Bellyreragh where she was in service. It was there that the classic recording of Maggie and her niece Sarah singing Linkin' o'er the Lea (The Auld Beggarman) was made. This influential recording was subsequently released on the Caedmon LP series Folk Songs in Britain and Ireland in 1961. Maggie came from a musical family and many of her songs came from her mother. Her father was also a good singer but she'd say that he wouldn't teach her whole songs like her mother did. Maggie left service to get married and was married for thirty years until her husband died in 1981. I first met Maggie at an Inishowen Singers weekend in Donegal. She was on fine form in front of a very appreciative audience and it was Norma Waterson (who had known Maggie for many years) who suggested that I should record her. Taking advice from Keith Summers, who had recorded Maggie in 1979 (see MTCD329-0 The Hardy Sons of Dan) and Sean Corcoran who had recorded her in the early 1990s, I made many visits to Maggie's bungalow in Tempo always to be greeted with, "Come on in, you're welcome!" My recordings were published in 1996 on VT134CD Linkin' O' the Lea. These afternoons at Maggie's, in front of her Aga with the tea pot constantly simmering and Maggie smoking cigarette after cigarette were always magical. The songs would tumble out one after another interspersed by fits of laughter, for Maggie was not only one of the finest traditional singers I ever met, she was also one of the wittiest! 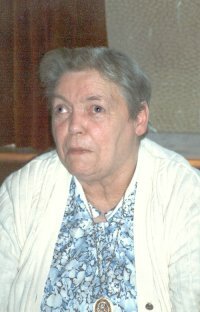 In later life she found new audiences for her songs and not only in her own locality; she was also invited to several singing weekends across Northern Ireland and she appeared on The Pure Drop on RT� television. Maggie Murphy will be greatly missed by anyone who met her. Hopefully her recordings will inspire the next generation of singers, and what is certain is that she will always have a very special place in Ulster's traditional singers hall of fame.